There is a brief moment of silence that is broken by the rhythmic strum of a guitar accompanied by the distinct raspy vocals of Gerard Way, the front man of My Chemical Romance. 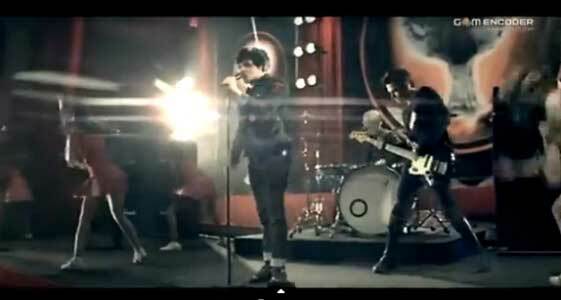 This popular emo-core band is known for their and artistic persona, and their music video for the song “Teenagers” is no exception. Creepy looking cheerleaders in white chucks. It takes place in an empty high school gym. There is a large stage set up on which the band is located and in front of them are a few hundred empty fold out chairs, setting the stage for what looks like a school assembly. A dozen stereotypical cheerleaders join the band on stage and began dancing to the loud beat of the drums that has joined the vocals and guitar. They wear high pony tails, matching red uniforms and perfectly white chucks. 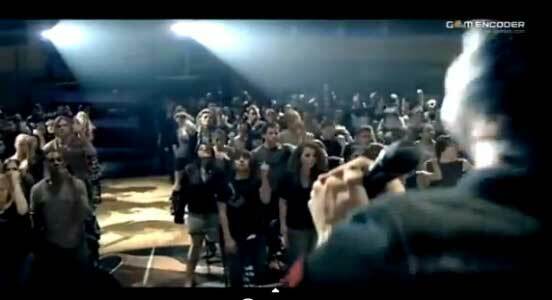 It all seems completely normal until the start of the first chorus when a crowd of alternative looking teenagers burst into the gym and fill the empty seats. It is at this point that the cheerleaders put on gas masks, immediately transforming this typical high school assembly into the creepy music video style that My Chemical Romance is known for. My Chemical Romance performing with dancing cheerleaders. From there the setting continues to transform from a high school to a wild concert with the teenagers eventually rushing the stage to make their way up to the band. It is while they are scrambling over the barriers that one can see how many of them are wearing black chucks (both low cut and high cut). Over all it’s interesting to see the different types of chucks used in this video, and though its abstract qualities may not appeal to everyone, it’s worth watching to at least check out the chucks.